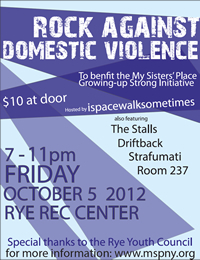 To benefit the My Sisters’ Place Growing-Up Strong Initiative. Calling all high school students/teens! $10 at the door. Hosted by ispacewalksometimes. Also featuring The Stalls, Driftback, Strafumati, and Room 237. 7-11pm, Friday, October 5, 2012, at the Rye Rec Cemter. Special thanks to the Rye Youth Council. For more information visit www.mspny.org.